During a November 2009 trip to Tokyo, President Barack Obama underlined his intent to lead the United States to new levels of engagement in the Asia Pacific and harkened back to his upbringing in Indonesia and Hawaii, calling himself the United States’ “first Pacific president.” As he approaches the spring of 2014, Obama must decide if he will fulfill this legacy. It is not only the president’s place in history that is on the line, but the United States’ national security and economic future. The geopolitical calculus clearly defines the need for the United States to be comprehensively invested in Asia. But the country is stuck in an anachronistic and self-absorbed political atmosphere, where politicians view words such as “trade,” “Asia,” and “foreign policy” as negatives that should be avoided. A paradigm shift in U.S. thinking is needed. The United States needs to recognize that the country’s jobs, safety, and future are inextricably tied to Asia. The outdated Cold War mindset and myopia choking cogent policymaking in Washington must be overcome. The only way for President Obama to live up to his self-described goal to make the United States a leader in the Asia Pacific is for him to tell Americans the truth, shift the political rhetoric, and lead. The president holds all the necessary levers to drive this overdue shift, but he needs to act now, not wait until after November’s mid-term elections to set a course that will anchor U.S. interests in Asia. The context for the change in thinking has been established. The United States has declared its “pivot” to Asia, now branded as a “rebalancing.” The U.S. military has been forthright and relatively efficient in implementing its updated posture in the Indo-Pacific region. Those steps are evident and clear. Now it is necessary to bring trade and people-to-people ties to the table. This historic window will not remain open for long. Most of Asia wants and needs the United States to substantially deepen its engagement across the region. China is the motivating factor behind this strong pull for U.S. engagement. Asian friends and allies want to know that the United States’ new focus on the region is sustainable. In this context, words matter. Keen Asian analysts, friends, and competitors are looking for the establishment of a political foundation in the United States that clearly defines U.S. interests in economic growth, security, innovation, and cooperation on global issues in Asia. Talk to Americans about Asia. Before making his April visit to South Korea, Japan, Malaysia, and the Philippines, the president should begin talking about the importance of Asia to U.S. citizens. And he should do it in U.S. cities like Akron, Des Moines, and Oakland, where economic growth is an existential issue. Spend political capital on Trade Promotion Authority. The United States’ partners in the Trans-Pacific Partnership (TPP) negotiations will not believe Washington is ready to close the trade deal unless the president and senior White House staff knock heads on Capitol Hill to get Trade Promotion Authority. Without it, there is no clear path to ratification of the TPP in Congress. The U.S. economy will wither over time unless the country can help drive economic integration and compete in Asia. The TPP is imperfect, but economically and geostrategically essential to U.S. national interests. First, the president must work on getting Democratic leaders in Congress aligned with the White House. Second, he must reach out to a pro-trade Republican like Senator Rob Portman to make the case. Deploy Susan Rice to Asia. Neither Americans nor Asians believe National Security Advisor Susan Rice has developed a real sense of what is at stake in the Asia Pacific. She has not visited the region since assuming her new job, and her Asia speech at Georgetown University in November did not convince either those wanting to believe or the skeptics that she was developing a good feel for regional issues and personalities. She should travel to Asia to advance the president’s April and November trips, meet and engage key leaders, and position herself to be the key adviser on a real turn to the region. The United States’ force posture needs roots in the Philippines. Many observers expect that President Obama will be able to announce the completion of an agreement for greater rotational access to the Philippines for the U.S. military. But any Philippine presidential candidate in 2016 will face the atavistic urge to find fault with that agreement. To ensure any deal has deep and sustainable roots in the Philippines, the United States should expand its investment in humanitarian assistance and disaster relief work and in maritime security operations, the importance of which were proved by the post-Typhoon Haiyan relief effort and China’s occupation of Scarborough Shoal. The president should also ensure that likely Philippine presidential candidates, especially Vice President Jejomar Binay, are on stage with him and President Benigno Aquino if he announces an agreement. The theme of strengthening ASEAN needs to be developed and supported. While in Malaysia, Obama should advance the theme of a strong ASEAN. This was most recently advanced by John Kerry last week during his visit to the ASEAN Secretariat to meet Secretary-General Le Luong Minh. The president should talk about the need to strengthen ASEAN, both through its members’ own investments in the institution and through support from the United States and other partners such as Australia, Japan, Korea, and the European Union. Partner with the private sector. The most powerful chords of U.S. engagement across the Indo-Pacific region outside the security sphere have been through the private sector, including both companies and nonprofit organizations. Other nations do not have the level of private-sector development or international engagement that the United States does. If the U.S. government added a wide definition of private investment to its narrative of U.S. involvement in Asia, no other country could contest the comprehensiveness of its involvement. The White House should use this strength and the president should bring U.S. corporate leaders with him to Malaysia, stand tall with private humanitarian groups in the Philippines, and embrace the role of U.S.-based nongovernmental institutions involved in the region. While critics of the administration suggest that the rebalance to Asia is losing steam and being sacrificed to domestic political realities, they can and should be confounded by a proactive shift toward the region led by President Obama during this spring of opportunity. Clashes in Bangkok leave at least 4 dead, 64 injured. Thai security forces and antigovernment protesters on February 18 clashed in the Phan Fa Bridge district of Bangkok, leaving at least one policeman and three protesters dead. Security forces were trying to dislodge protesters who since January have encamped in different parts of Bangkok to shut down the city. City government officials said at least 64 people were injured, including 24 police officers. Thai police reportedly arrested nearly 200 people at the Phan Fa and another protest site. Anti-Corruption Commission to charge Yingluck as farmers protest missed rice payments. The National Anti-Corruption Commission on February 18 said it would bring charges against Prime Minister Yingluck Shinawatra for alleged negligence of duty in her management of the government’s rice-pledging scheme. The commission said it would summon the prime minister to defend herself on February 27 and then send its verdict to the Senate for an impeachment trial. Thai rice farmers have rallied in Bangkok since February 6 to demand back payments from the scheme that is supposed to pay farmers up to 50 percent above the market price for their rice. Some farmers have reportedly not been paid their share of the subsidy for up to six months. Constitutional Court rejects opposition bid to void elections; new poll dates set. Thailand’s Constitutional Court on February 12 rejected the antigovernment People’s Democratic Reform Committee’s bid to void national elections held on February 2. The ruling clears the way for new polls to be held in districts unable to vote due to disruptions by protesters. The country’s Election Commission on February 19 announced that make-up voting for those blocked from casting ballots in some districts would be held on March 2. The commission has not scheduled by-elections for 28 electoral districts in which candidates were prevented from registering. Thai authorities deport 1,300 Rohingya back to Myanmar. Thailand’s national immigration chief, Lieutenant General Pharnu Kerdlarpphon, said on February 13 that the country deported about 1,300 Rohingya back to Myanmar between September and November 2013. The deportations came despite calls from human rights groups not to send the Rohingya back to Myanmar, where they face widespread discrimination and are denied citizenship. Thousands of Rohingya have fled sectarian violence in western Myanmar since it flared up in 2012. Thailand’s immigration chief says the deportations were voluntary. Thailand hosts annual Cobra Gold exercises. Cobra Gold, an annual multilateral military drill hosted by Thailand and the United States, kicked off in Thailand’s northern province of Phitsanulok on February 11. Seven countries contributed personnel and at least 20 countries, including for the first time China, sent observers to the exercises, which are the largest in the Asia Pacific. Drills have so far focused on humanitarian assistance in case of conflict situations and disaster relief. Around 10,000 military personnel are taking part in the exercises, which will continue until February 21. Journalists’ arrests, lawmaker’s interrogation spark concerns about press freedom. Four journalists and the CEO of the Burmese-language newspaper Unity were arrested between January 31 and February 5 for publishing an article about an alleged chemical weapons factory. It was the first in a series of recent developments that have observers concerned that Myanmar is backpedaling on press freedom. Ruling party lawmaker Shwe Maung, an ethnic Rohingya, was questioned by authorities on February 4 for telling the nonprofit media organization Democratic Voice of Burma that police might have been involved in the burning of Rohingya homes in January. Foreign journalists have also reported receiving visas of shorter durations that make it difficult to work in the country full-time. NLD, 88 Generation to cooperate on constitutional reform. National League for Democracy (NLD) leader Aung San Suu Kyi and representatives of the 88 Generation Peace and Open Society group announced on February 4 that the two organizations will cooperate on pushing for constitutional amendments to ensure that real democracy takes root in Myanmar. A leader of the 88 Generation group, which includes prominent student leaders of Myanmar’s 1988 democratic uprising, emphasized that the two groups are not merging, but rather cooperating on shared political goals. National cease-fire talks postponed until March due to disagreements among ethnic groups. Representatives of Myanmar’s ethnic armed groups have announced that national cease-fire talks with the Myanmar government will be postponed until March because the ethnic forces need more time to negotiate among themselves. The negotiations have been complicated by historical mistrust and competition for the chairmanship of the United Nationalities Federal Council, an umbrella group of 11 ethnic organizations. Cease-fire talks are expected to be further complicated by a resurgence in violence in northern Kachin state, where the Myanmar military on February 12 overran a Kachin Independence Army outpost. U.S. Export-Import Bank to finance short- and medium-term exports to Myanmar. The Export-Import Bank of the United States announced on February 6 that it will begin funding short- and medium-term U.S. export sales to Myanmar. Available support includes export-credit insurance, loan guarantees, and direct loans for up to five years, with additional long-term support available if country risks are externalized or eliminated. In announcing the initiative, Chairman Fred Hochberg emphasized the importance of engaging with Myanmar to reintegrate it into the global economy. Thein Sein pushes for federalism in Union Day speech. President Thein Sein on February 12 used his Union Day speech to call for the establishment of a federal system to boost national development. His past Union Day speeches have emphasized the need for unity and downplayed ethnic groups’ demands for greater decentralization. Thein Sein also referenced the 1947 Panglong Agreement in which Myanmar’s independence hero Aung San negotiated a federal system with Chin, Kachin, and Shan leaders. Government officials have traditionally shied away from mention of the agreement. Kerry visits Indonesia. U.S. secretary of state John Kerry visited Jakarta on February 16–17, wrapping up a three-country tour to Asia that included stops in South Korea and China. Kerry and Foreign Minister Mary Natalegawa cohosted the fourth Joint Commission Meeting of the U.S.-Indonesia Comprehensive Partnership and signed two agreements, one on combatting illegal wildlife trafficking and the other on cooperating on development projects in third countries. Kerry also made a speech on climate change at the U.S. Embassy’s @america high-tech outreach venue and met with ASEAN secretary general Le Luong Minh at the organization’s secretariat. Jokowi reshuffles agency heads in Jakarta. Jakarta governor Joko “Jokowi” Widodo recently replaced or reshuffled more than 30 top officials at government agencies in the Indonesian capital, according to a February 12 Jakarta Post article. Jokowi made the changes in response to recent public transportation and sanitation failures, as well as high-profile cases of alleged fraud. Many of the removed agency heads were moved to a newly created working unit to supervise development projects. Volcanic eruption kills three, displaces 100,000. Mount Kelud on the densely populated island of Java erupted on February 13, killing three people and forcing more than 100,000 to evacuate. Six airports were shut down as a result of the eruption, and heavy ash fell in major cities including Surabaya and Yogyakarta. Ash reached as high as eight inches in some areas around the mountain. Volcanologists do not think that another major eruption is imminent, despite continued low-level geologic activity. Foxconn to build major plant in Jakarta. Representatives of Taiwan-based contract manufacturing giant Foxconn and Jakarta governor Joko “Jokowi” Widodo on February 7 signed a letter of intent for the company to build a major electronics assembling factory in north Jakarta. Foxconn CEO Terry Gou said his company hopes to invest at least $1 billion in Indonesia in the next five years. He also indicated that Jokowi played a significant role in building confidence and making progress to facilitate the investment. Muhammad Lutfi appointed trade minister. President Susilo Bambang Yudhoyono on February 14 tapped former Indonesia Investment Coordinating Board chairperson Muhammad Lutfi to become trade minister. Lutfi replaces Gita Wirjawan, who stepped down from his post to run for the Democrat Party’s nomination for 2014 presidential candidate. Lutfi most recently served as Indonesia’s ambassador to Japan and the Federated States of Micronesia. Aquino calls on cabinet to intensify job creation amid ballooning unemployment. President Benigno Aquino on February 11 ordered his cabinet to intensify job creation and social protection programs after a recent survey by independent polling body Social Weather Stations indicated that unemployment in the country increased to 12.1 million at the end of 2013. Presidential spokesman Edwin Lacierda said the increase was understandable due to the natural disasters that hit the country in the last quarter of 2013. Labor Secretary Rosalinda Baldoz said that special attention would be given to 30 priority provinces hit hardest by the disasters. Presidential adviser says Bangsamoro deal to be signed by March. Teresita Deles, the presidential adviser on the Philippine government’s peace process with the Moro Islamic Liberation Front, on February 12 said that the government and the rebel group are likely to sign a comprehensive peace agreement by early March. Senate president Frank Drilon on February 6 said that a bill to serve as the legal basis for the formation of an autonomous Bangsamoro region on the southern island of Mindanao, as called for in the agreement, is Congress’s top priority and will be passed by the end of 2014. Government recovers $29 million from former president Marcos’s Swiss accounts. Chairman of the Presidential Commission on Good Government Andres Bautista on February 12 said that the Philippine government has recovered an additional $29 million from the Swiss bank accounts of former president Ferdinand Marcos and his family. The funds are believed to be the last of Marcos’s Swiss accounts and are part of more than $712 million recovered and now in the government’s possession. Around $224 million of the sum is allotted to pay victims of human rights violations committed during the Marcos regime. U.S. ambassador says basing deal to take longer than expected. U.S. ambassador to the Philippines Philip Goldberg on February 6 said that negotiations for an increased U.S. military presence in the Philippines may take longer than initially expected. The two countries initiated negotiations in August for greater U.S. rotational access to bases in the Philippines, but they hit an impasse in November over disagreements regarding Philippine access to would-be U.S. facilities. The two countries concluded their fifth round of negotiations on February 5, with the next round scheduled for March. Vietnam on 2013 risk list for journalists. The New York-based Committee to Protect Journalists (CPJ) placed Vietnam on its 2013 list of countries where freedom of the press is at risk. The list, released on February 12, specifically criticized Vietnam’s crackdown on Internet bloggers, which intensified in 2013, and noted that the government is believed to be behind a series of cyber-attacks at home and abroad. Vietnam issued several decrees in 2013 targeting dissident bloggers, and it ranks second in Asia, behind China, for the number of journalists imprisoned. Vietnam appears before UN human rights commission. Representatives from Vietnam appeared before the United Nations Human Rights Council (UNHRC) in Geneva on February 5 for the country’s Universal Periodic Review. The UNHRC issued over 200 recommendations for Vietnam to improve its human rights record, including abolishing the death penalty, improving freedom of religion, and ending persecution of government critics. Vietnam was chosen to join the UNHRC in 2013 despite its dismal record on human rights. First McDonald’s opens in Ho Chi Minh City. Vietnam’s first McDonald’s fast food restaurant opened in Ho Chi Minh City on February 8. McDonald’s entered the country through a partnership with Vietnamese-American businessman Henry Nguyen, who is the son-in-law of Prime Minister Nguyen Tan Dung. McDonald’s will compete with other U.S. fast-food chains that have already established themselves in the Vietnamese market, including KFC and Burger King. Dissident released after experiencing violent arrest. Authorities released Vietnamese human rights activist Nguyen Bac Truyen on February 10 after violently arresting him the day before at his home in the southern province of Dong Thap. Truyen and his fiancée say police surrounded their home, fired gunshots, and blindfolded Truyen before taking him to be questioned in Ho Chi Minh City. Truyen was using online social media to criticize the government’s oppression of a Buddhist religious group. Lawmaker's satirical video sparks outrage. Ethnic Chinese lawmaker Teresa Kok, vice chair of the opposition Democratic Action Party, released a satirical Chinese New Year video on January 27 that has been accused of insulting Malays and Islam. The video features a mock talk show poking fun at various national issues. Hundreds of police reports have been lodged against Kok, and protesters launched a campaign offering money to anyone who would publicly slap her. The reaction to the video appears to be the latest example of a widening gulf between the country’s majority Malay population and its ethnic and religious minorities. Budget deficit shrinks more than government target. Malaysia trimmed its fiscal deficit to 3.9 percent of gross domestic product in 2013, beating a government target of 4 percent, according to a February 12 report by Bloomberg. Prime Minister Najib Razak has implemented a number of fiscal reforms, including cutting subsidies, to trim the country’s budget gap and avoid a potential credit-rating downgrade. The government hopes to trim the deficit to 3.5 percent in 2014 and to 3 percent in 2015, eventually balancing the budget by 2020. Sarawak state chief minister resigns. Abdul Taib Mahmud has announced that he will step down as Sarawak’s chief minister on February 28 after more than three decades leading the resource-rich state on Borneo. Taib is expected to remain a powerful political figure and seek the ceremonial title of governor, an unelected position that requires appointment by Malaysia's monarch, according to a February 12 Channel News Asia report. The 77-year-old veteran politician selected special functions minister Adenan Satem, his former brother-in-law, to succeed him. United States to strengthen naval ties with Malaysia. Royal Malaysian Navy chief Abdul Aziz Jafaar on February 11 said that Malaysia and the United States will promote closer maritime relations, including more visits by U.S. Navy ships. He made the announcement after meeting with his U.S. counterpart, Admiral Jonathan Greenert, who made his first official visit to Malaysia from February 10 to 12. Greenert also met with Prime Minister Najib Razak and visited a Malaysian submarine base in Kota Kinabalu, on Borneo. Talks between opposition, government may resume. Officials with the opposition Cambodia National Rescue Party (CNRP) said talks with the ruling Cambodian People’s Party (CPP) to negotiate an end to a months-long political standoff could resume following opposition leader Sam Rainsy’s February 10 return from a trip to Europe. Rainsy lobbied the European Union and United Nations to put pressure on the CPP to yield to opposition demands for an independent investigation into the country’s contested July 2013 elections. Journalist covering illegal fishing beaten to death. A group of fisherman attacked Cambodian newspaper journalist Suon Chan and beat him to death in the central province of Kampong Chhang on February 1. Chan was reporting on illegal fishing in the Tonle Sap River and is believed to have angered local fisherman with his articles. Reporters Without Borders and other press freedom organizations urged Cambodian authorities to thoroughly investigate Chan’s murder and not to rule out links to his work on illegal fishing. Phnom Penh launches public bus system. Cambodia’s capital city Phnom Penh launched a trial public bus service on February 5 to help relieve the city’s traffic problems. The system will employ a single pilot route serviced by 10 buses and will be tested for a month. If the trial is successful, the city government will roll out more routes. Bus fares are priced to be cheaper than motorcycle taxi rates, a popular way to travel throughout the city. United States warns China against ADIZ in South China Sea; Russel calls nine-dash line illegal. Evan Medeiros, Asia director at the U.S. National Security Staff, on January 30 warned China not to set up another air defense identification zone (ADIZ) in the South China Sea, as it did in the East China Sea in late 2013. He warned that such a move would trigger a shift in U.S. military posture in the region. Shortly afterward, Assistant Secretary of State for East Asia and the Pacific Danny Russel said on February 5 that China’s use of a nine-dash line to claim territories in the South China Sea not based on land features is inconsistent with international law, marking the U.S. government’s strongest-ever legal denunciation of China’s claims. Aquino calls for more international support against China’s claims. Philippine president Benigno Aquino in an interview with the New York Times on February 4 called on the international community to do more to support the Philippines in its effort to resist China’s claims in the South China Sea. Aquino likened China’s assertive claims to German aggression in the lead-up to World War II. His comments followed similar remarks by Japanese prime minister Shinzo Abe, who in January likened Japan and China to Britain and Germany, which went to war in 1914 even though they had close economic ties. TPP advisers meet; ministerial meeting confirmed for February 22–25 in Singapore. The Office of the U.S. Trade Representative convened a full-day meeting on February 11 for all Trans-Pacific Partnership (TPP) advisers to discuss the next steps in the negotiation of the trade deal. During the meeting lead negotiators briefed advisers on TPP-related sticking points such as the environment, intellectual property, and state-owned enterprises. The meeting was also intended to prepare advisers for an upcoming TPP ministerial meeting on February 22–25 in Singapore. Senator Wyden says trade promotion authority not top of agenda. Incoming Senate Finance Committee chairman Senator Ron Wyden indicated on February 11 that he would not make the pending Trade Promotion Authority (TPA), or “fast-track” bill, a priority. Senator Wyden, who is replacing Senator Max Baucus as chairman of the committee, said he would first consult his fellow Democratic senators on the changes they want in the TPA bill before taking any action. Senate Majority Leader Harry Reid had said earlier that he was opposed to passage of TPA at this time. Singapore objects to Indonesia’s naming of naval vessel after 1965 bombers. Singaporean officials have reacted angrily to the Indonesian military’s announcement in early February that it intends to name a vessel “KPI Usman Harun” in honor of two Indonesian marines who were executed in Singapore in 1965 for bombing a busy Singaporean bank. The bombing, which came at the height of Indonesia’s aggressive Konfrontasi campaign, killed 3 and injured 33 people. It was long a source of tension between the two countries. Indonesia boycotted the February 11–16 Singapore airshow as a result of the city-state’s objections to the naming of the navy vassel. Singapore hosts major biennial airshow. Singapore hosted its fourth biennial airshow from February 11 to 16, attracting more than 40,000 visitors from 125 countries. More than $32 billion worth of commercial nonmilitary deals were reached or announced during the show, including by Airbus, Boeing, Embraer, and Rolls-Royce, according to a February 14 Singapore Business Review article. Manufacturers also showcased military equipment, including unmanned drones and advanced weapons systems. Government to work with U.S. State Department on unexploded ordnance education. The U.S. State Department on February 12 signed an agreement with the Lao Ministry of Education and Sports to fund unexploded ordnance (UXO) education and awareness projects in Laos. The two agencies will partner with World Education, a U.S.-based nonprofit organization. Only about 2,000 of Laos’s approximately 9,000 primary schools currently incorporate UXO instruction into their curricula. Laos falls short of rice production target. Lao farmers have planted less than 110,000 acres of rice, 35 percent less than the government’s target, since the dry season began in November, according to a February 4 report by Radio Free Asia. Laos is expected to harvest considerably less than the government’s target of 500,000 metric tons of rice by the end of the dry season in April. The shortfall is due in part to farmers opting to plant cash crops such as watermelon, eggplants, and tomatoes rather than rice. Japanese investment in Laos up 15 percent. Japanese investment in Laos reached nearly $406 million in 2013, up 15 percent from 2012, driven in part by rising labor costs in China and manufacturers relocating from Thailand after devastating 2011 floods in that country, according to a February 12 Vientiane Times report. At present 60 Japanese companies are based in Laos. Japanese multinationals Nikon Corporation and Toyota Motor Corporation plan to shift parts of their production bases from Thailand to Laos. 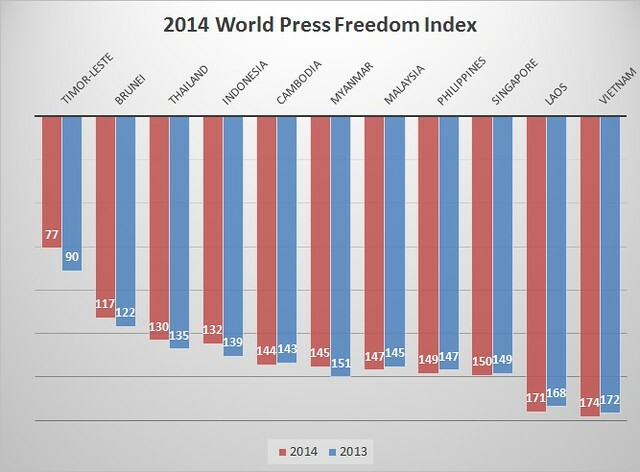 Myanmar bests some neighbors in Press Freedom Index. Myanmar jumped 6 places to 145 out of 179 countries in Reporters Without Borders’ World Press Freedom Index 2014, released on February 12, thanks in part to reforms allowing private daily newspapers for the first time in decades. Myanmar’s ranking now surpasses those of neighbors Malaysia, the Philippines, and Singapore. Thailand and Indonesia also improved, from 135 to 130 and 139 to 132, respectively. The region’s highest scorers were Timor-Leste, which jumped 13 places to 77, and Brunei, which improved by 5 to 117. Vietnam was ranked lowest in the region, dropping from 172 to 174. Southeast Asia’s progress in the World Press Freedom Index 2014 was decidedly mixed, Timor-Leste leads the region in press freedom and Myanmar made impressive gains, while Vietnam remained the lowest ranked country in the region. Brunei hosts workshop on regional hotlines for incidents at sea. Brunei’s Ministry of Defense held a workshop on February 10–13 to discuss establishing hotlines between ASEAN nations as a step toward avoiding undesired incidents at sea and coordinating emergency responses. The workshop is expected to be the first in a series and stems from discussions at the May 2013 ASEAN Defense Ministers’ Meeting. A total of 46 participants from the United Nations, the ASEAN Secretariat, and individual ASEAN countries attended the workshop. India approves services FTA with ASEAN. Indian officials reported on February 12 that the country’s cabinet had approved a free trade agreement (FTA) for services with ASEAN, clearing the last domestic hurdle to signing the agreement. The signing has been postponed since December. The services agreement follows an India-ASEAN FTA in goods that took effect in 2013. Indian and ASEAN officials hope to increase trade between India and the organization’s member states to $100 billion by 2015. Timor-Leste agrees to purchase weapons from Indonesia. Timorese prime minister Xanana Gusmão and Indonesian defense minister Poernomo Yusgiantoro on February 10 agreed that Timor-Leste would purchase weapons made by the Indonesian defense industry. The two officials also agreed to boost joint defense training and to step up border protection cooperation. The agreement marks a considerable improvement in bilateral relations between Timor-Leste and its former occupier. Peter Doyle appointed Australia’s ambassador to Timor-Leste amid spying scandal. Australian foreign minister Julie Bishop on February 11 announced that Peter Doyle will replace Miles Armitage as ambassador to Timor-Leste. Doyle is a career officer in the Department of Foreign Affairs and Trade and has served as ambassador to Turkey and deputy head of mission in Malaysia. He takes up his post at a low point in relations, which have been strained by allegations that Australia spied on Timorese officials during negotiations over a treaty for oil and gas revenue sharing. Discussion on ASEAN centrality in Southeast Asia. The Carnegie Endowment for International Peace will host a presentation February 20 on the role of ASEAN in Southeast Asia. The University of South Carolina’s Donald Weatherbee will speak about ASEAN’s effectiveness in the face of heightened tensions over the South China Sea and other shifts in regional power. The event will take place from 10:30 a.m. to 12:00 p.m. at 1779 Massachusetts Ave., NW. Please RSVP here. Discussion on the health effects of Typhoon Haiyan in the Philippines. Georgetown University’s Asian Studies Program will host a panel discussion February 21 on the health situation in the Philippines following Typhoon Haiyan. Panelists will include experts from the World Food Program, Save the Children, and other organizations that work in the area. The event will take place from 3:30 p.m. to 5:00 p.m. in Georgetown University’s Bunn Intercultural Center (ICC), Suite 241. Please RSVP here by noon on February 21. Event on the future of Malaysia’s media. The ASEAN Studies Center at American University and the Malaysia-America Society will cohost a discussion February 21 on the Malaysian media’s loss of influence and challenges in handling government censorship in recent years. Kean Wong, a Washington-based Malaysian journalist with extensive experience in the region, will lead the discussion. The event will take place from 6:30 p.m. to 8:30 p.m. at American University’s School of International Service, 4400 Massachusetts Ave., Room 333. To RSVP, please e-mail Alyssa Briggs. Conference on U.S.-Japan strategies in Myanmar. The Carnegie Endowment for International Peace will hold a full-day conference February 25 on the political and economic changes in Myanmar and opportunities for the United States and Japan to cooperate in supporting its development. Panelists will include experts from the Japan External Trade Organization, the U.S. Agency for International Development, General Electric, and Yangon Heritage Trust. The event will begin at 8:30 a.m. at the Carnegie Endowment, 1779 Massachusetts Ave., NW. Please RSVP here. Presentation on resilient development in Myanmar and ASEAN. Partnerships for International Strategies in Asia at George Washington University will host a presentation on February 27 by Stony Brook University professor Nay Htun exploring the challenges Myanmar and ASEAN face in pursuing sustainable and resilient development. The event is part of the Climate-Wise Development Roundtable Series. It will take place from 12:00 p.m. to 1:30 p.m. in the Lindner Family Commons, Room 602, Elliott School of International Affairs, 1957 E St., NW. Please RSVP here. Seminar on Asian integration and the Trans-Pacific Partnership. The East-West Center in Washington will hold a discussion March 3 on influential factors for Asia’s integration. The discussion will focus on maritime territorial disputes, the role of the United States in the region, and the Trans-Pacific Partnership. Panelists will include Ganeshan Wignaraja of the Asian Development Bank and Ellen Frost of the East-West Center and National Defense University. The event will take place from 12:00 p.m. to 1:30 p.m. at 1819 L St., NW, Sixth Floor. Please RSVP here. Conversation on the role of policy in natural resource scarcity. The Center for Strategic and International Studies will host Andrew Mackenzie, CEO of Australian mining giant BHP Billiton, on March 6 to discuss his experience with resource scarcity. The event will be the first in CSIS’s newly launched U.S.-Australia Speaker Series. The conversation will take place from 10:00 a.m. to 11:00 a.m. at CSIS, 1616 Rhode Island Avenue, Conference Room 212. Please click here for more information and to RSVP.